Seattle Mayor Jenny Durkan announced last year that the city will develop a plan to toll city roadways, part of its efforts to reduce traffic congestion and greenhouse-gas emissions. And the state plans more toll lanes on I-405 in the coming years. Seattle Mayor Jenny Durkan announced last year that the city will develop a plan to toll city roadways, part of its efforts to reduce traffic congestion and greenhouse-gas emissions. Such a plan remains only in the research stages, and Durkan has said little publicly about it since her announcement nine months ago. The last two city budgets have included a total of $1.2 million to study the idea. 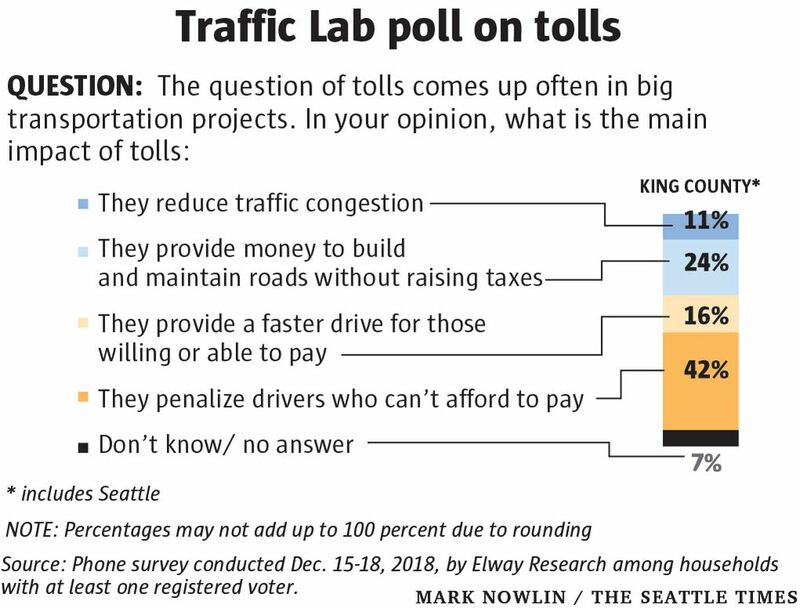 Tolling city streets would almost certainly require the approval of either the state Legislature or Seattle voters. And Seattle poll respondents aren’t wild about the idea. Only 26 percent said they favor or strongly favor the idea. Seattle-based Elway Research developed the poll in conjunction with The Seattle Times, which funded it. A total of 680 adult residents of King County were interviewed by telephone for this survey, resulting in samples of 407 in King County and 419 in the City of Seattle (146 Seattle respondents were included in the King County sample). The interviews were conducted December 15-18, 2018, by live interviewers; 49 percent were conducted via cellphone. The margin of sampling error is plus or minus 5 percent for both the county and city samples. This means that, in theory, had this same survey been conducted 100 times, the results would be within five percentage points of the results reported here at least 95 of those times. The idea was the second-least popular of seven transportation-related proposals that The Seattle Times polled and that local officials have discussed recently. Adding more bike lanes is more popular (although not that popular). More bus lanes is more popular. Expanding the downtown streetcar is more popular. Charging impact fees on new construction is more popular. Only allowing more apartment buildings to be built with no parking proved less popular. Seattle-based Elway Research conducted the poll last month by cellphone and landline, resulting in a sample size of 419 people in Seattle and 407 people in King County (including Seattle). The margin of error is plus or minus 5 percent. Seventy-five percent of the respondents were homeowners, compared to about 57 percent in the county. Durkan, in an interview last week, stressed that the city is at the very beginning of discussing congestion pricing and what it might look like. She said she wanted to make sure that any tolling system didn’t disadvantage low-income people. “Having grown up here, I don’t think we’re a region that has ever seen a toll we like,” Durkan said. “We have to have a real conversation about what the benefits are. Countywide, respondents aren’t anxious to expand the more limited form of congestion pricing that we already have. 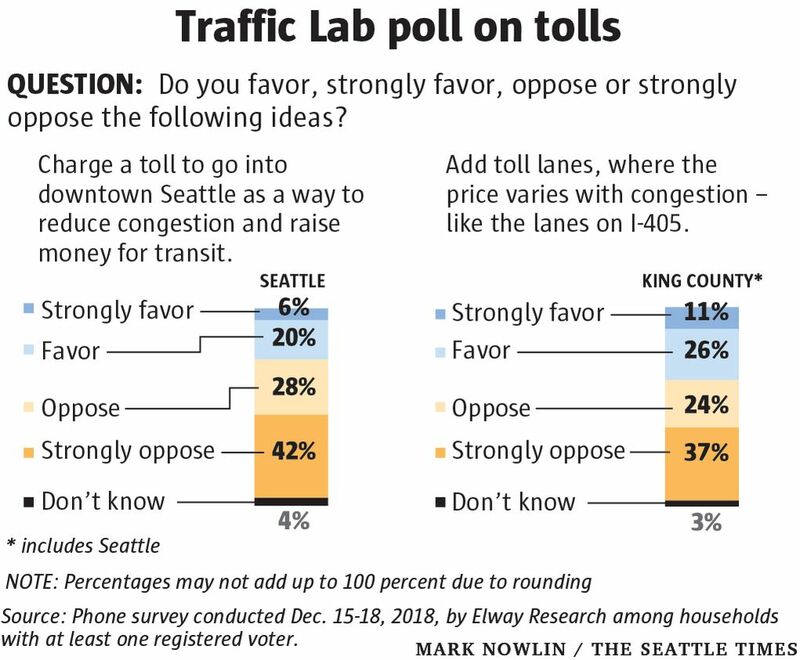 Sixty-one percent of respondents oppose or strongly oppose adding “toll lanes where the price varies with congestion — like the lanes on I-405.” Only 37 percent favor the idea. 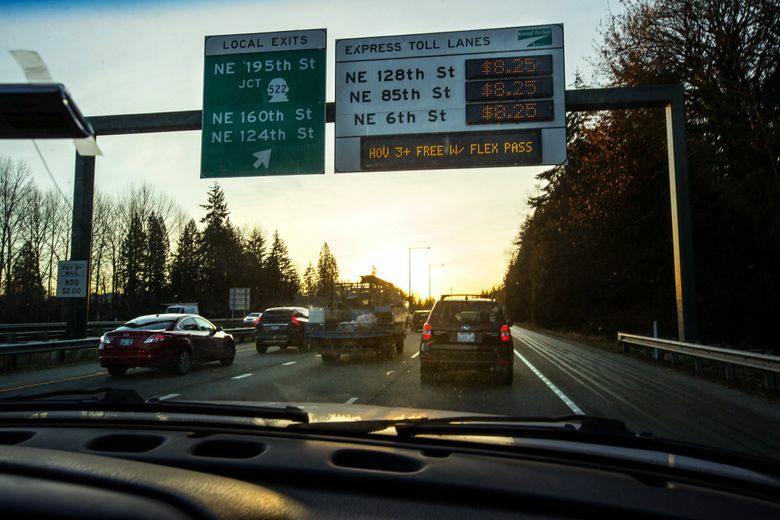 Nevertheless, this year the state plans on beginning a five-year project to widen I-405 between Bellevue and Renton, creating two new express toll lanes in each direction. Jessica Spytek, 60, a health-care strategist who just moved from Queen Anne to Bainbridge Island, said the region’s public transit isn’t yet at the level it would need to be to give people an alternative to tolled roads. No American city has implemented a broad congestion pricing plan of the type that Durkan has proposed. New York City has been working to charge a toll to drive into the most congested areas of Manhattan for more than 10 years, but plans keep getting bogged down in the state Legislature. But foreign cities that have done downtown tolling — London is by far the most prominent — have found success, with less traffic congestion and more revenue for public transit. The opposition party forced a public referendum to repeal the tolls. But it didn’t happen until they’d been in place for seven months. Congestion decreased by 30 to 50 percent in the interim. The referendum failed. By 2014, two-thirds of the public and every major political party supported the tolls. But, locally, respondents don’t see tolls as primarily a traffic-reducer. “They reduce traffic congestion” came in last, with only 11 percent of respondents citing that as the main impact of tolls. Annelise Wagner, 29, a graduate student in mathematics at the University of Washington, favors expanding public transit, but doesn’t like the regressive nature of tolls — you’re charged the same amount no matter how much money you make.